Track your subway and bus rides with MetroCost and learn which is the best deal for you: an Unlimited Ride or a Pay Per Ride MetroCard. 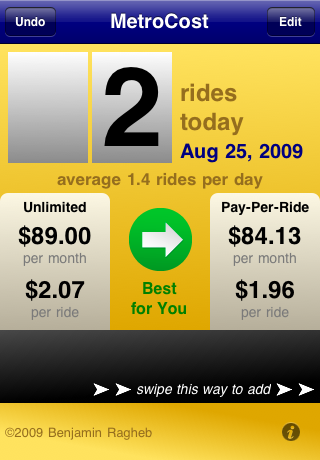 Each time you ride, launch MetroCost and swipe a finger along black strip to record it. When it's time to buy a new card, launch MetroCost to see which is the best deal for you, based on the past 30 days. MetroCost is perfect if you use public transit frequently, but not every day. Or, if you're simply curious about how much you spend and if you are getting your fare's worth. You can customize MetroCost for any transit system where fares do not depend on distance traveled. Along with New York Ciy's MTA, fare information and color schemes for San Francisco's Muni and Atlanta's MARTA are included. MetroCost is available on the iTunes App Store for your iPhone or iPod touch. Questions? Direct all correspondence to help@metrocost.com.